After two months in Ireland (see previous post), I returned to Scotland to walk the West Highland Way. This 96-mi (154-km) long footpath through the Scottish highlands is listed among the top 20 epic trails in the world by National Geographic magazine. 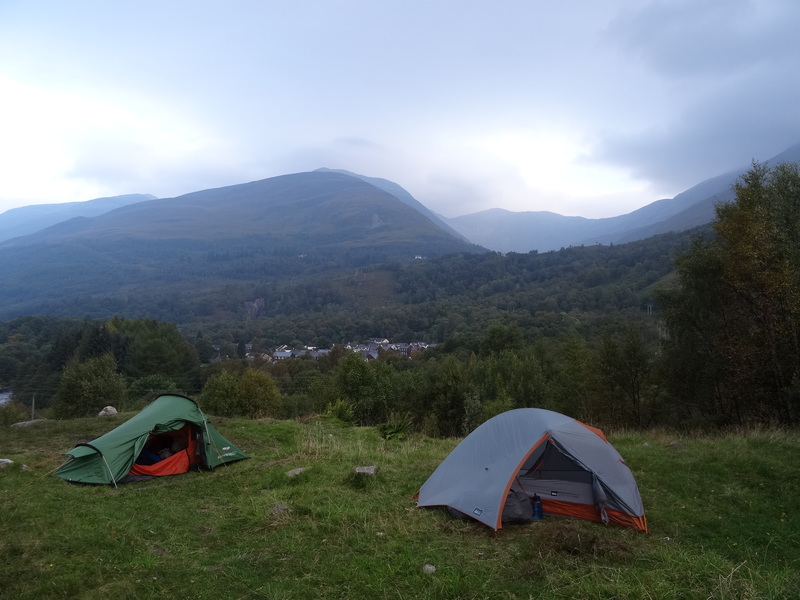 So how did I spend 7 days in the Scottish highlands? Trekking of course! Upon arriving in Glasgow, I reconnected with Dave (England) who I’d met in Chile (Parque Nacional Torres del Paine) and traveled with for almost three weeks in Argentina (El Bolson, El Chalten, and Bariloche). From Glasgow, we took a short train ride to the small town of Milngavie where the trail begins. After getting a map and taking a few pictures, we started the walk. 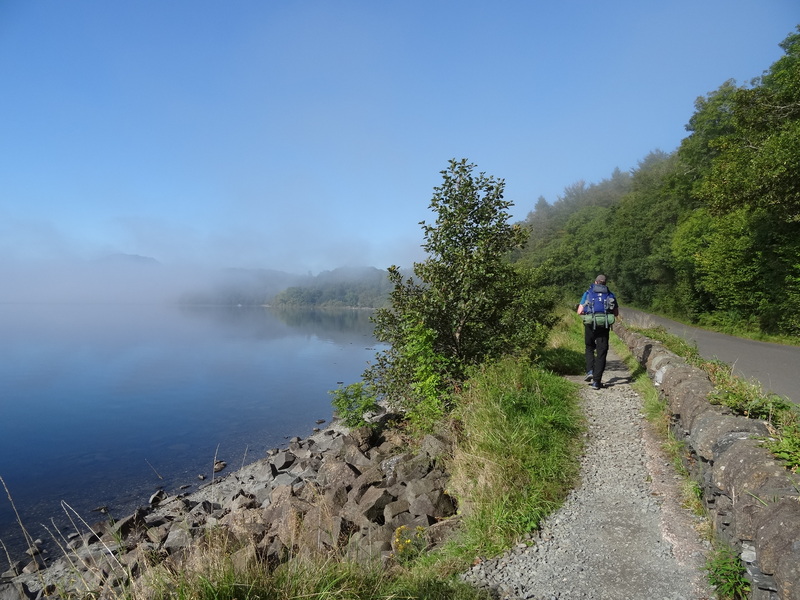 The West Highland Way links hike/bike trails between the small towns and villages it passes through. Per Wikipedia, parts of the trail follow ancient roads such as drover’s roads (to herd livestock), military roads, and coaching roads. 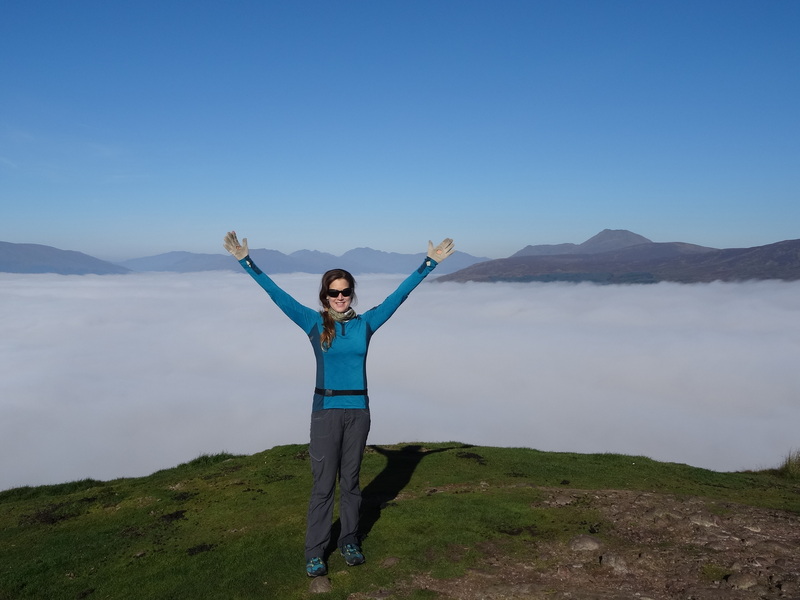 Upon its opening in 1980, the West Highland Way became the first officially designated long distance footpath in Scotland, and in 2010, it was co-designated as part of the International Appalachian Trail. 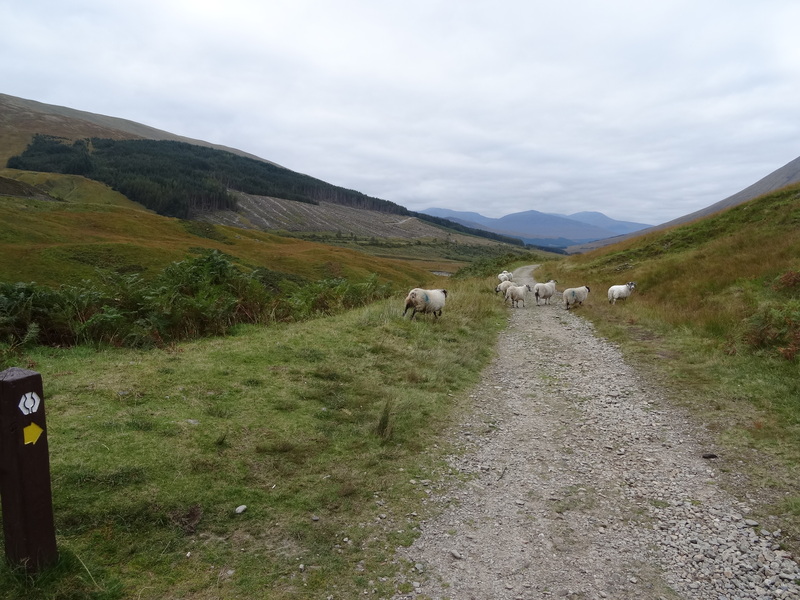 While on the trail, Dave and I trekked through varying landscapes including rolling pasture lands dotted with black-faced sheep, native grass and shrub lands, and valleys bordered by rugged mountains, crossed numerous rivers and small streams, and walked for a day and a half along the shores of 23-mi long Loch Lomond. We also walked through patches of woodland and forest, some natural and some artificially created. Per the West Highland Way website, most of Scotland’s pine forests are made up of nonnative species such as sitka spruce, larch, and douglas fir. However, ancient Caledonian pinewood forests (consisting of Scots pine, juniper, birch, willow, rowan, and aspen trees) once spread across thousands of kilometers of the highlands. These native forests now remain at just 84 protected sites covering 180 km2 in the north and west where restoration is ongoing. Walking through the patches of forest was beautiful, contrasting sharply with the vast areas of pasture and grasslands, but walking through the patches of ancient pinewood forest was magical. 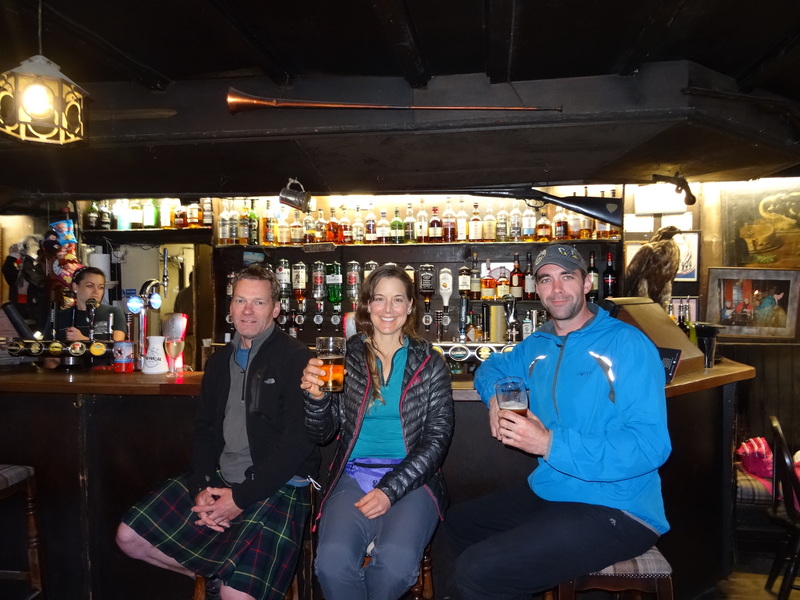 Along the way, we passed through several small towns and villages, the “villages” typically consisting of a hotel or lodge with a pub welcoming walkers to rest, use the facilities, and have a pint. Similar to my previous experiences in Scotland, the locals were very friendly, being used to hordes of walkers on the West Highland Way. 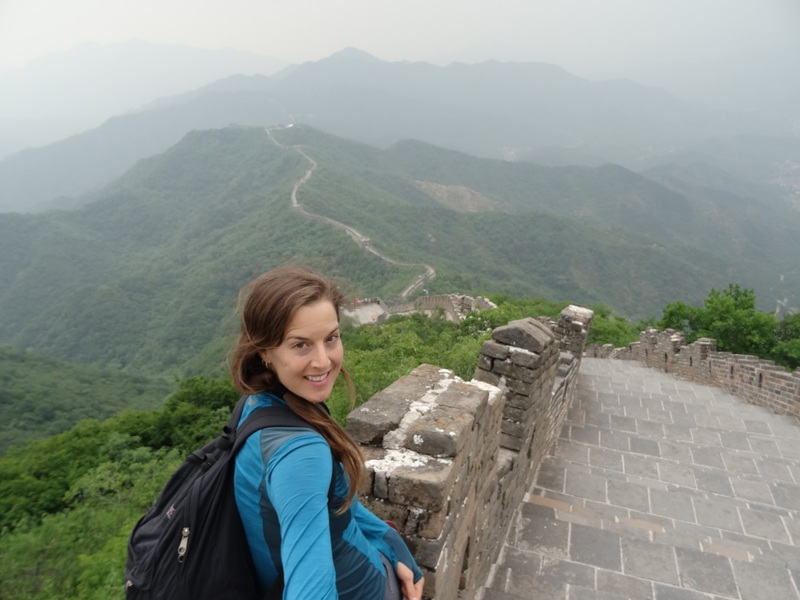 Fortunately for us, we walked during the low season and therefore often had long stretches of the trail to ourselves, meeting only a handful of other walkers during the day. On our first day, we met Richard, a Scotsman, who we ended up walking and camping with intermittently throughout the rest of the trek. We was a wealth of information about Scotland, the highlands, and the walk. And, he walked in a kilt, adding to my Scottish walking experience (ha!). While many walkers opt to stay at the hotels along the trail, Dave and I tent camped each night, mostly at developed campgrounds. Besides having access to facilities (i.e., toilets and showers), camping at developed campgrounds also allowed us to enjoy a pint with our fellow walkers at the end of the day. A perfect way to end a long day of walking! On our last day, Dave and I did a 10-mi (16-km) roundtrip side hike to the summit of Ben Nevis, the highest peak in the United Kingdom at 4,409 ft (1,343 m) then walked the last few miles of the end of the trail in Fort Williams. The summit was cold, windy, raining, and thick with clouds, preventing any type of view, but it was a great end to our 7-day adventure. 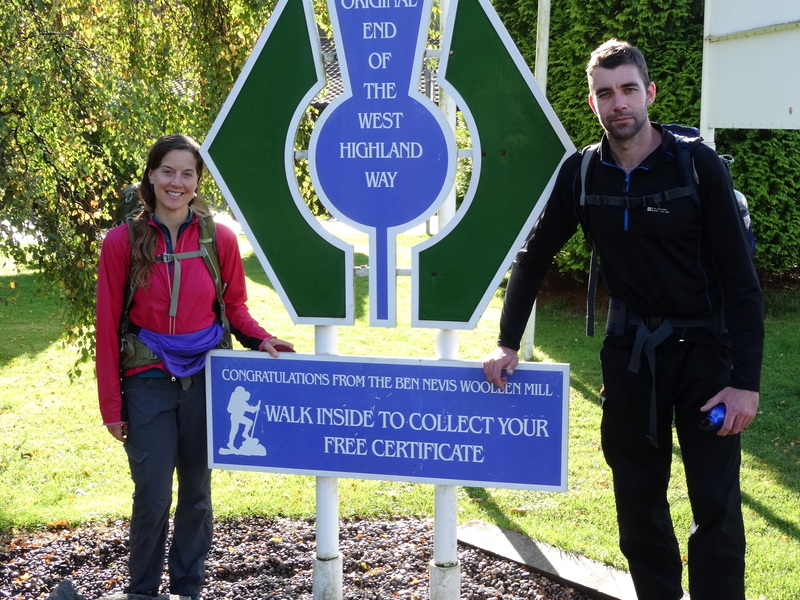 Walking the West Highland Way was a great way to explore the beautiful Scottish highlands, and my experience was made even more memorable by the people with whom I walked. Oh, and by the amazingly good weather we enjoyed for most of the trek (which we were told repeatedly is quite unusual). Thanks Dave for trekking with me again!